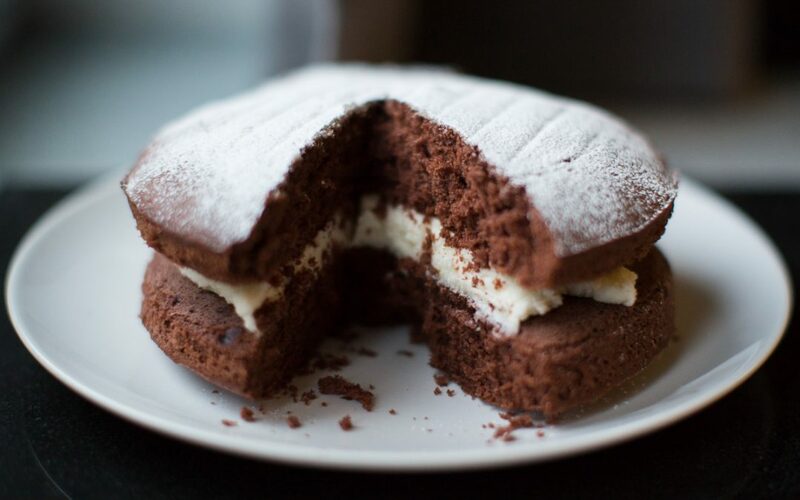 A quick and easy to make chocolate cake with a generous helping of buttercream filling. The best thing about this cake is I don’t have to make it any more as both my kids are experts on this recipe. Preheat the oven to 180∘C. Grease the sandwich tins with a bit of butter on a piece of kitchen roll. Beat the caster sugar and butter together until creamy (approximately 2 minutes with an electric whisk). Add the eggs, one at a time, beating well after each egg is added. If the mixture starts to curdle, sprinkle in a dessertspoonful of flour. Sift the flour and cocoa together into the mixture, then fold carefully into the sugar/butter/egg mixture using a metal spoon to reduce the amount of air you lose in the process. Divide the mixture equally into the two sandwich tins and smooth out till you’ve filled each tin evenly. Bake for 12 minutes until springy to the touch. While the cakes are cooling, beat together the butter and icing sugar to make the buttercream. When the cakes are cool, spread the buttercream on one and place the other on top. Decorate with a sprinkling of icing sugar.